Well, there are advent calendars and then there are chocolate advent calendars. I remember the thrill of my yearly advent calendar when I was a child and that daily count down to the big day. Growing up in a thrifty household, the same calendar was used for subsequent years, long before I’d ever heard of reduce, reuse, recycle. Luckily I never tired of opening the same windows each year to see what lay behind them; some of those pictures are still etched on my brain: a little robin redbreast, some mistletoe, a reindeer and of course the Baby Jesus all swaddled in his strawy crib. I was well into my adulthood before I knew there was such a thing as an edible advent calendar and of course now nothing will do but a chocolate-filled calendar to mark the run up to Christmas. 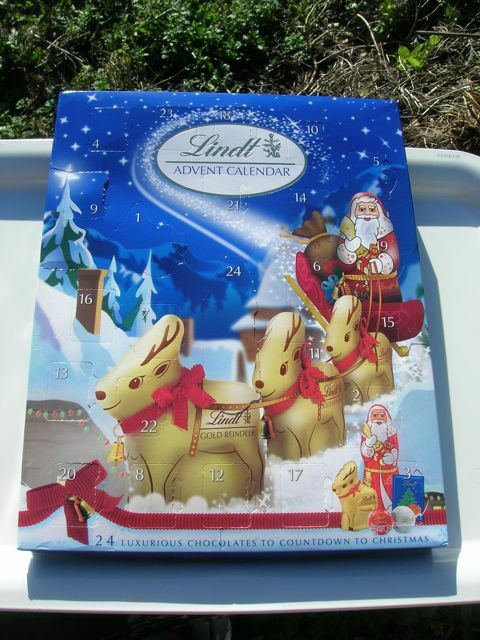 This year I have the most luxurious chocolate advent calendar yet, for review, courtesy of Lindt. It is called, accurately, although somewhat prosaically, Lindt Advent Calendar. I haven’t yet tried the chocolates as I want to save them for advent itself, but I know the delights I have to look forward to. I have not bought Nestle products for ethical reasons since I was a teenager; this has steered me towards that other well known Swiss chocolate company, Lindt, who in my opinion produce superior chocolates anyway. So what is it exactly that I am looking forward to? A snowy scene with Father Christmas and his golden reindeer bearing Lindt gifts adorns the face of the calendar, which measure 27 cm by 34 cm. Behind each of the 24 windows sits a Lindt chocolate waiting to be discovered. Five different types of milk chocolate, weighing in at 160g, make for a great way to indulge in a daily chocolate fix without the need to feel guilty. The chocolates are mostly wrapped in true Christmas colours of white, red and gold and make for pleasing decorations in their own right. I was glad to see that Lindor, albeit it in mini form, are amongst those featured. I still enjoy these truffles, which I once believed to be the height of chocolate sophistication. There are also mini golden reindeer, squares of milk chocolate, snowdrops filled with chocolate cream and last and definitely not least is the large milk chocolate Santa for Christmas Eve. The calendar is available at selected supermarkets and chocolate shops and at the Lindt online shop for £5.29. I was sent a Lindt advent calendar for review purposes. All opinions expressed are my own. NB 9/12/12 Now that I’ve started munch my way through the calendar, I’ve noticed that when the windows are open, there is a lack of festive cheer. Once the chocolates have been removed, you are left with a blank white space – an image behind the chocolate would much improve things. That’s a very impressive looking advent calendar. I love the fact that you get all different types of chocolate and even a Santa! It is not doubt that Lindt is one of the best chocolates you can find. It has an amazing melt in your mouth-creamy taste. Wow… I might just get some soon! I love these Christmas collection. Oh the Advent Calendar is so sweet. I was just having this discussion in the kitchen last night with my son about all the pictures I remember and the baby Jesus being behind no. 24. Advent was always special as it started on my birthday so I had 2 things to look forward to. I’m off to buy my advent canle today as my son reminded me that we didn’t have one yet. This this though the kids will not be getting a Lindt calendar but an Aldi one as the credit crunch is biting hard around our heels (much to my son’s disappointment)! For the real chocolate gourmet (not cheap! ), if you can find Lindt also now has (think since 2012) a Bittersweet chocolate advent calendar.